Posted on March 29, 2017 by Michelle M.
Meet Aussie, Chip (Chipper) and Oliver! These three are second generation cuties! 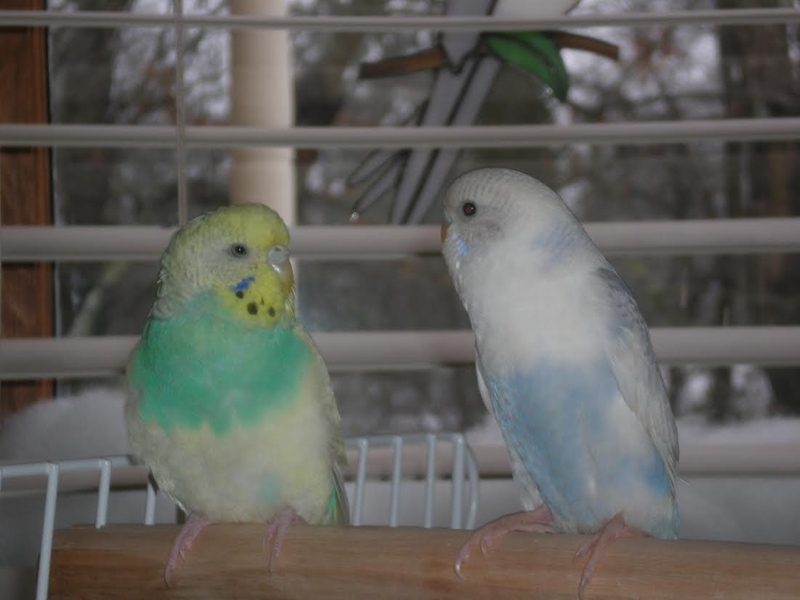 Mom and Dad are Peri Blue and Oscar. 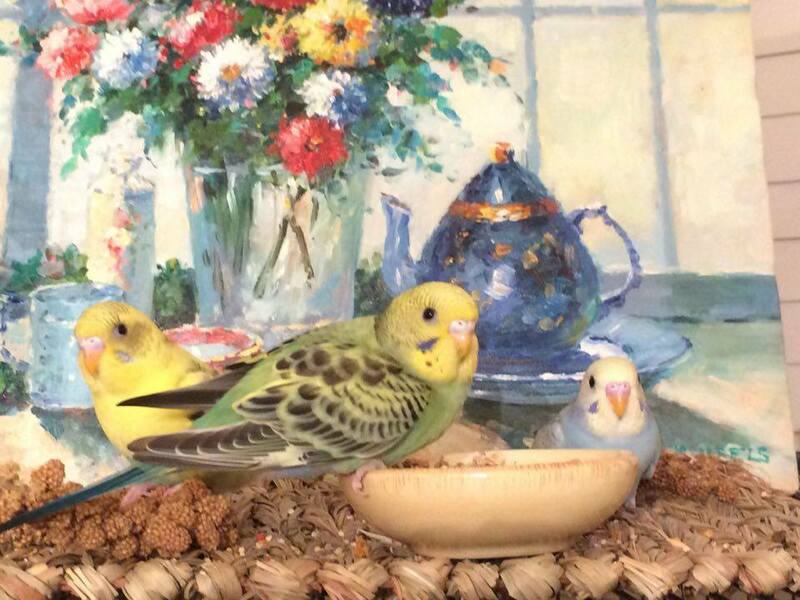 The little family lives with Susan in North Carolina. Offspring with proud papa, Oscar. And below mommy Peri Blue keeps the babies in line. 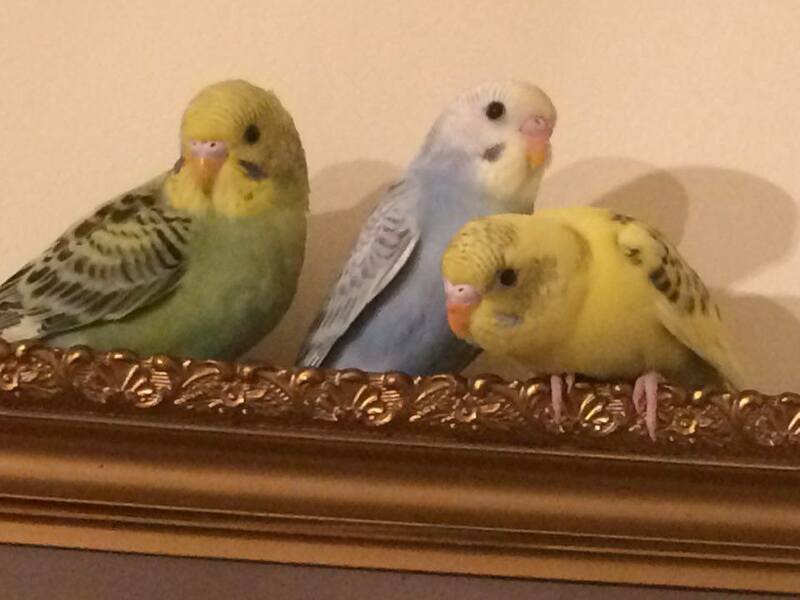 Aussie is blue, Chip is yellow and Oliver is green. These three like to argue and boss each other and their parents. They are in the large flight cage and they are on the move all day long. Each bird left the nest box flying and are all 3 excellent flyers. Aussie was the last to come out of the box. 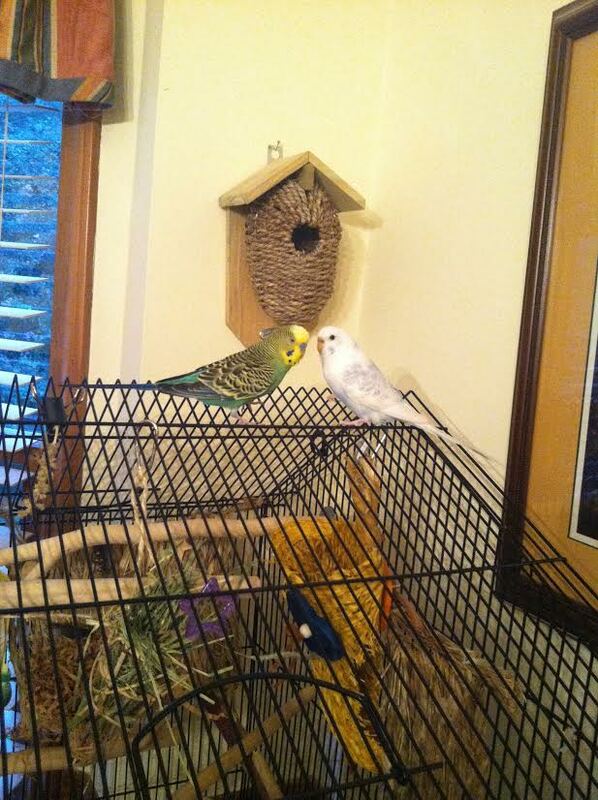 It took Peri Blue and Oscar 3 days of screaming at her to finally get her to come out. They just came out knowing exactly what to do. Now that they are all together they seem really happy. 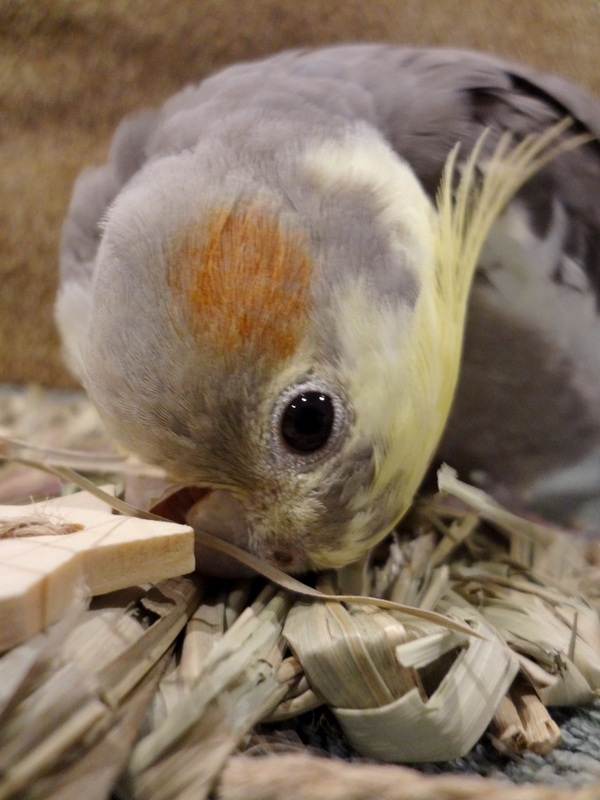 They eat lots of veggies, seeds, and pellets. 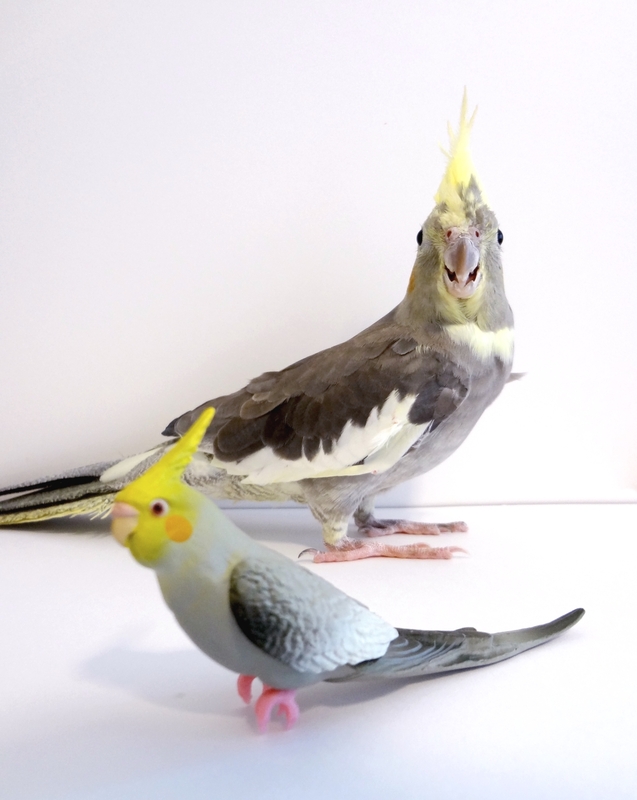 They love bath time and visiting Pete the cockatiel – and driving him crazy. But I think he likes the attention. If I am spending too much time with their cage he will fly over for a visit (and get his feet bitten for his efforts. 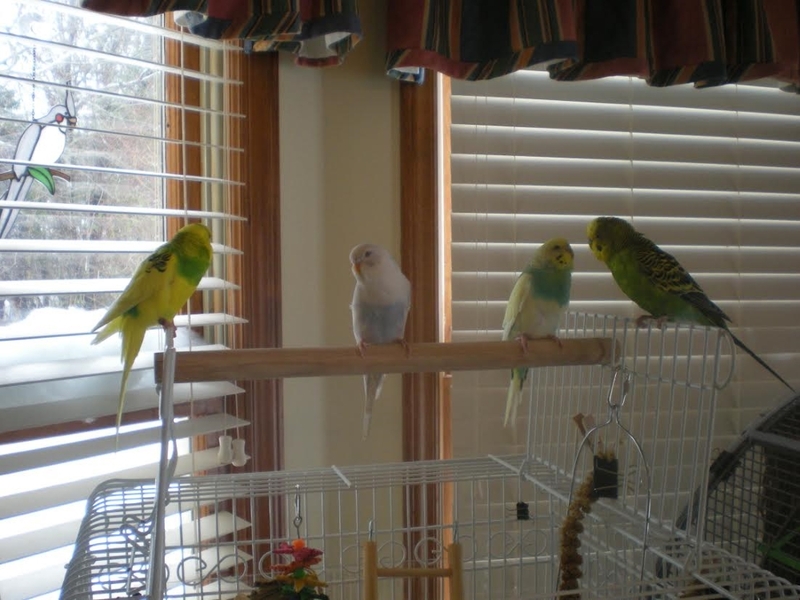 When they are out flying around, all I have to do is put on their night music and turn down the lights and they all go right in the cage and get on their swings. THANK GOODNESS! 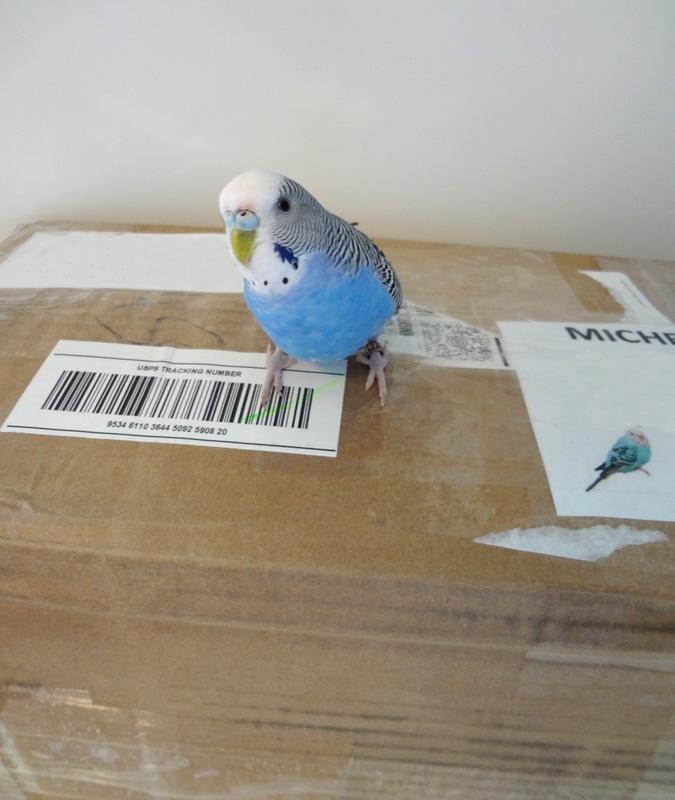 Posted on July 3, 2015 by Michelle M.
Recently, we received a package from Susan and her flock. 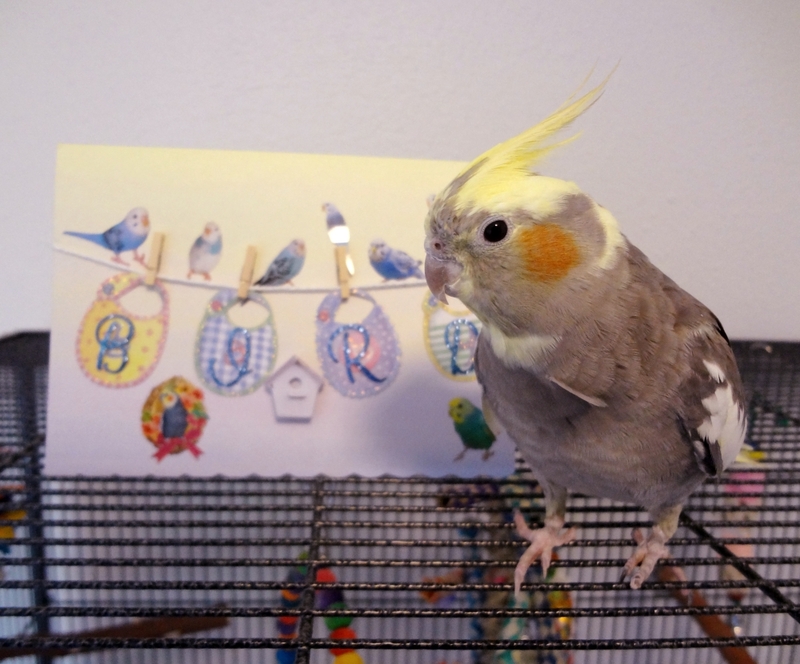 Inside was this lovely card, with a sticker for each of the birds, A Sido “mini mi”, an adorable cockatiel ring, and a shreddable play mat that Sido is happily taking apart. 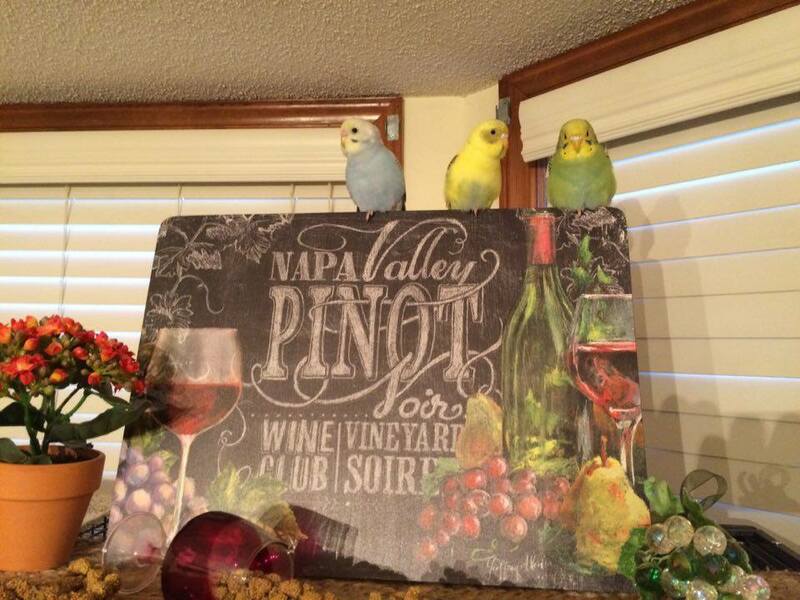 We are so very lucky to have such wonderful friends – thank you so much Susan! 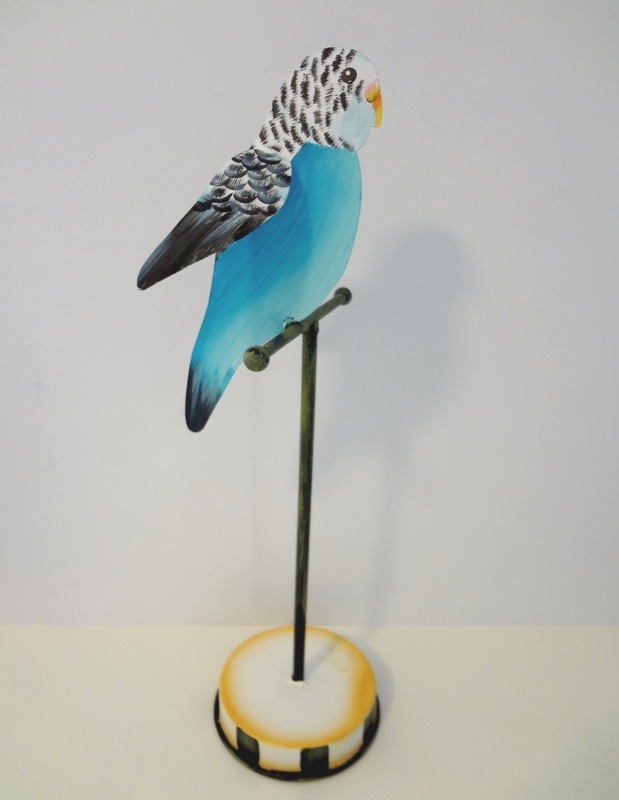 Posted on April 11, 2015 by Michelle M.
First up, from Susan – this fantastic budgie sculpture. I love it! Cooper and her new friend. 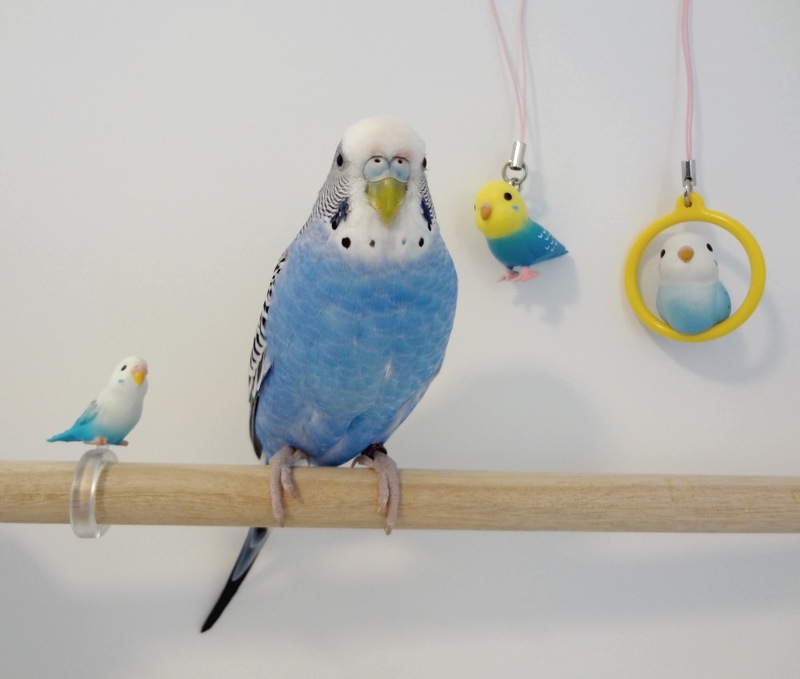 Susan also sent these little budgie charms and budgie ring. So cute! Thank you Susan! 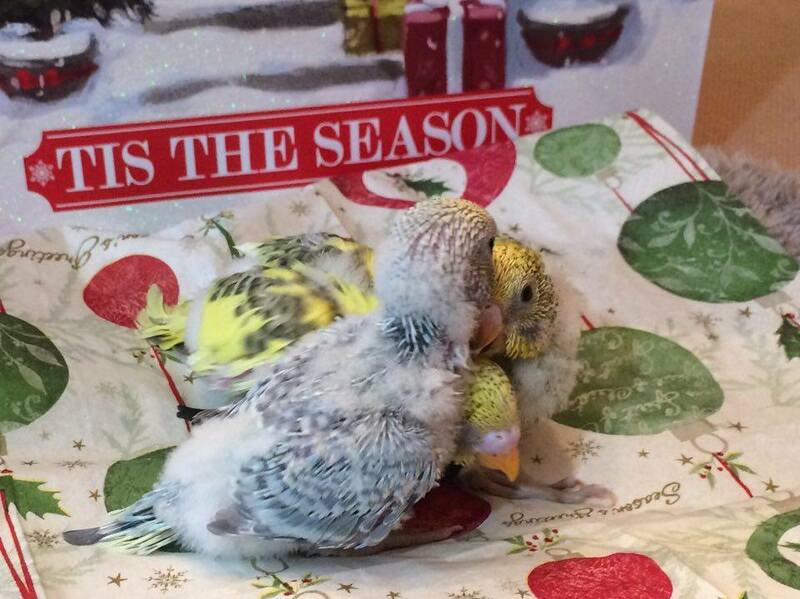 The budgies received a package from my niece Surena and her fiancé, RK. 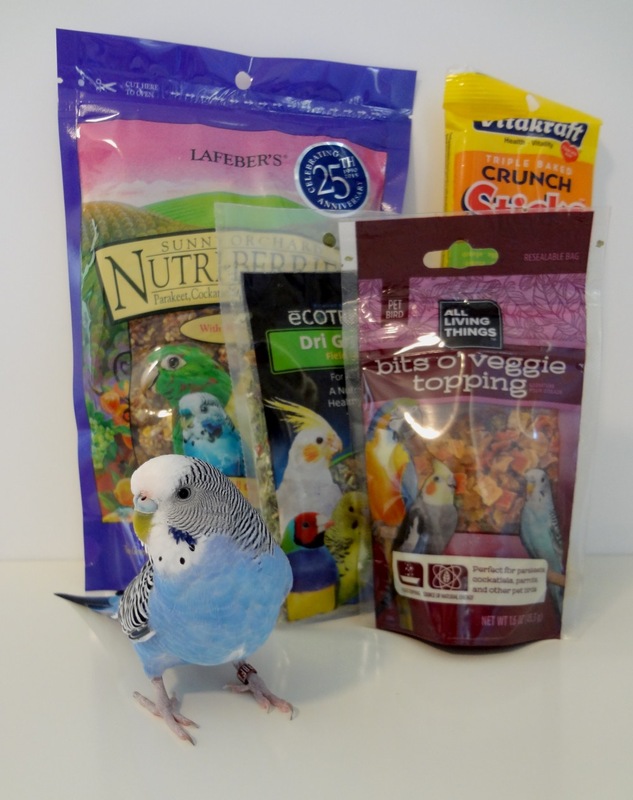 Look at all those treats – what lucky budgies! They also got this cute little bowling toy. Here is Ozzie right before he bowled a strike. Thank you so much Surena and RK! We’re so fortunate to have such wonderful family and friends. 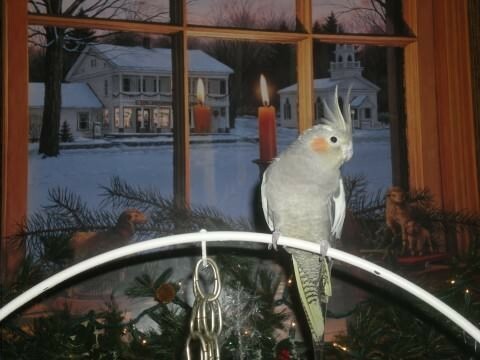 Posted on December 19, 2014 by Michelle M.
I kept hinting to my husband that we needed to get a mate for Oscar because he seemed lonely to me. 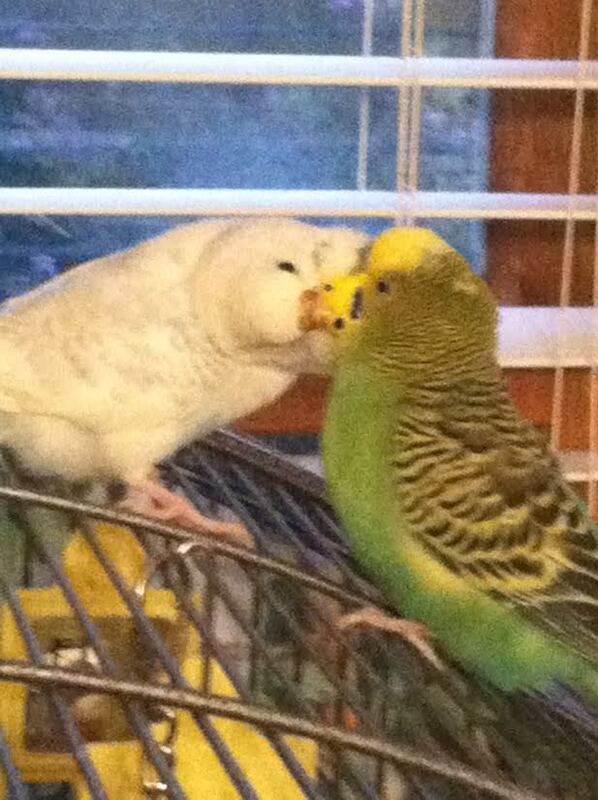 He is in love with our cockatiel Jo Jo but she does not feel the same at all. 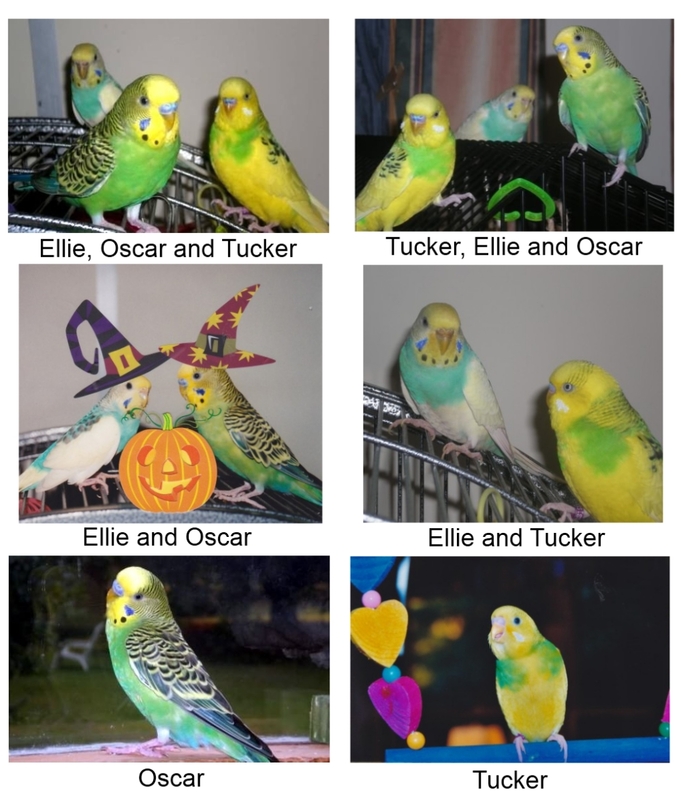 After going away for 2 nights and my husband caring for the birds, he said, “Oscar needs mate he is lonely.” I tried to get a budgie from http://bird.rescueme.org/NorthCarolina but at that time there were no budgies listed. As far as I am concerned anything from Craig’s list is a rescue. 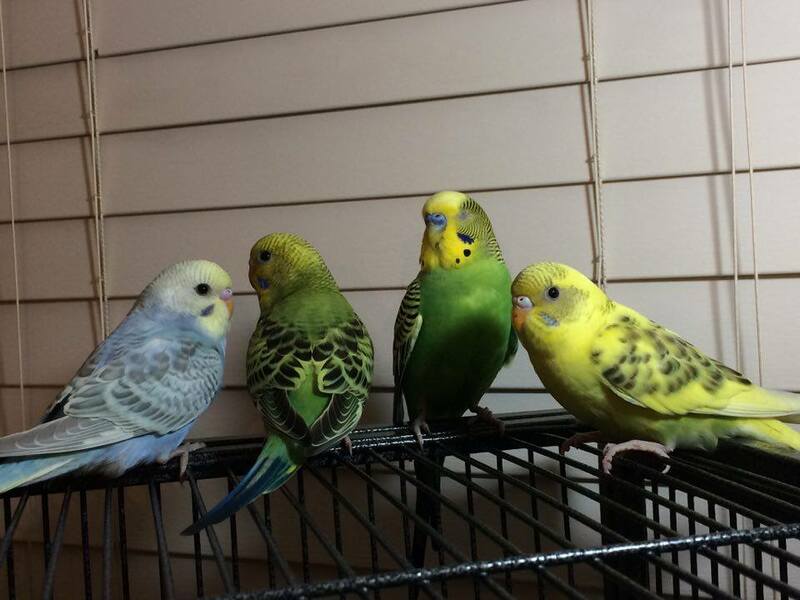 I found a lady who was selling budgies for $10. 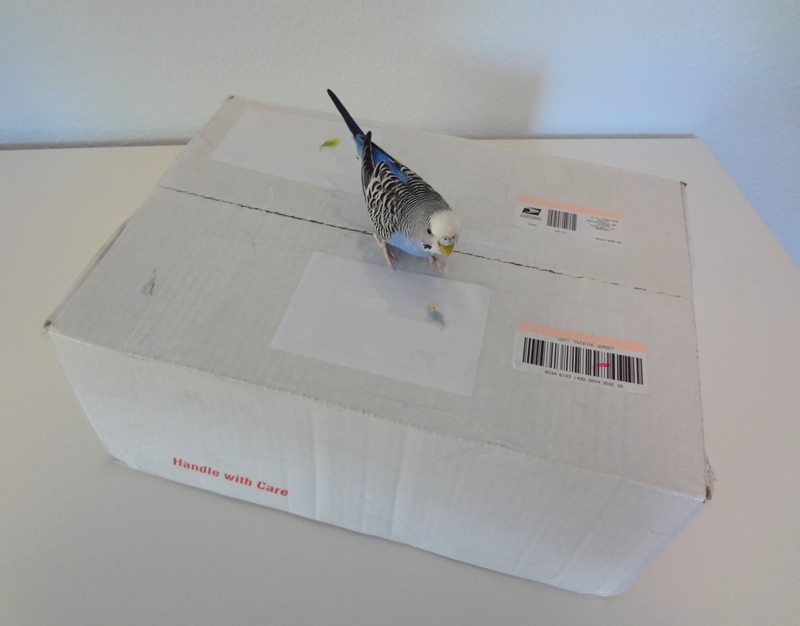 (HOW SAD) I made the call and went to pick up my budgie. Much to my surprise the cage she was in with her mother, father, and 2 siblings was very large and nice. They were all very healthy. 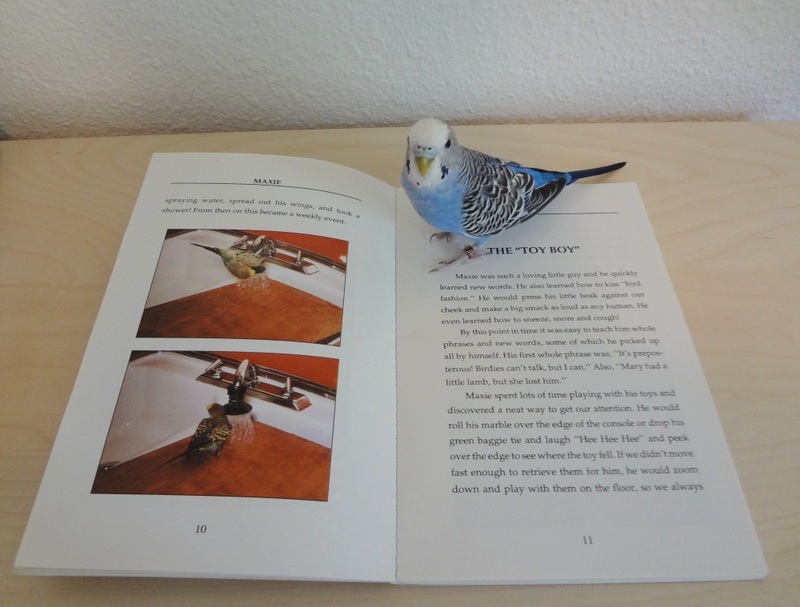 BUT Perri Blue’s wings had been clipped and she kept falling to the floor where a CAT sat waiting to pounce. The lady was not at all concerned about it. She also told me they cover them sometimes when they are watching TV because they are too loud. 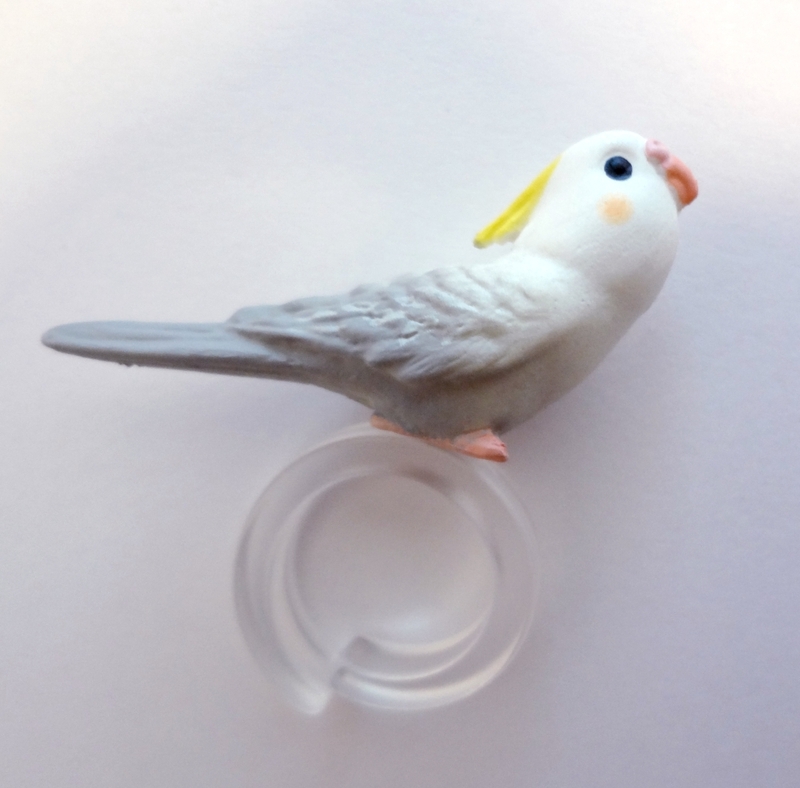 (budgie sounds are music to my ears) She did not seem at all concerned that the budgie would get a good home. 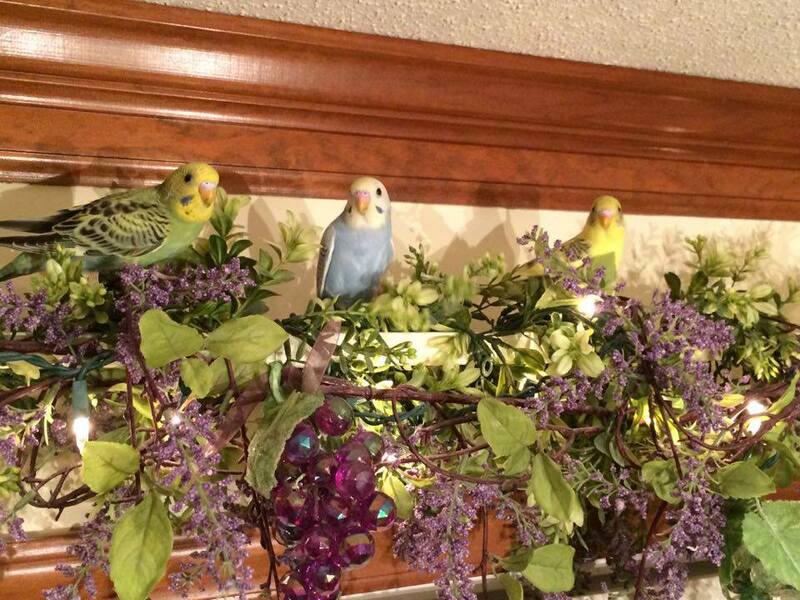 Perri Blue now lives with Oscar, Ellie, and Tucker. She is in love with Oscar and follows him everywhere. Oscar likes her most of time but you can tell his heart is still with Jo Jo (the cockatiel) From the beginning Ellie was not happy about another female and she was not very nice to little Perri Blue. 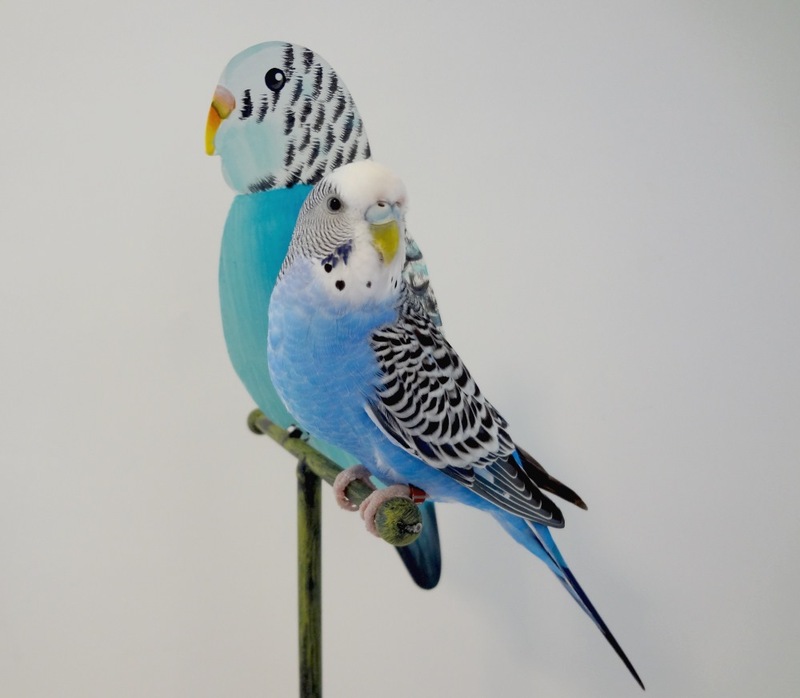 Now Perri Blue is the largest budgie in the flock and the most dominant too. It’s a soap opera for sure. 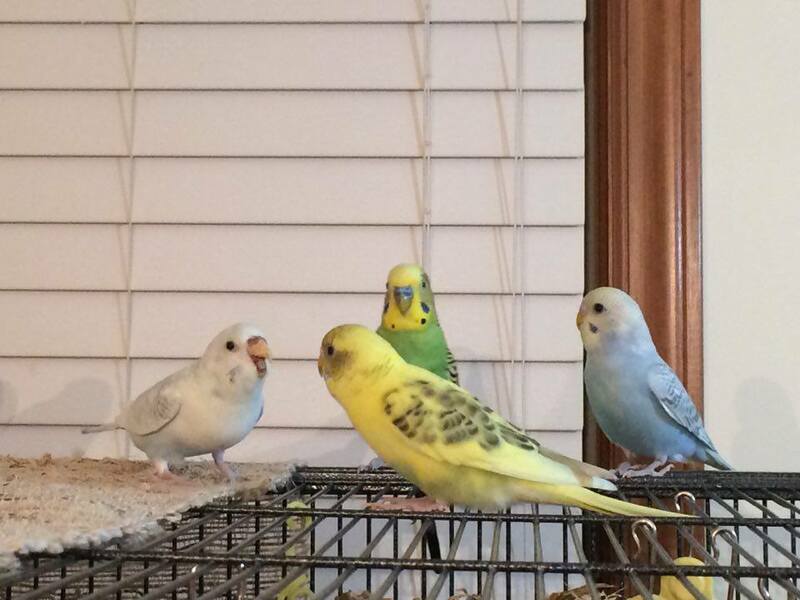 We recently bought the new extra-large cage and everyone seems to be much happier. I have 4 of the exact same swing and they all pick one to sleep on at night. 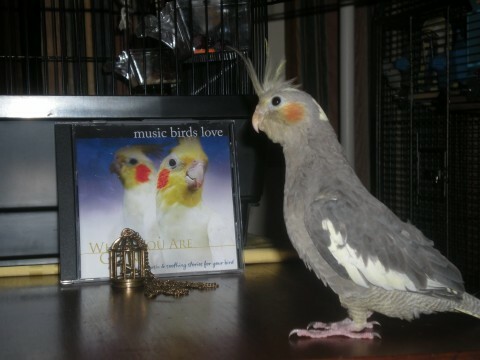 I play the same CD at bedtime and as soon as they hear the music they start winding down and find their swing. When Jo Jo hears the music she starts hissing at me because she doesn’t like to go to bed. 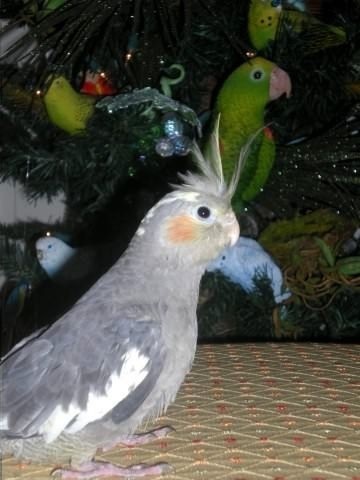 Posted on November 27, 2013 by Michelle M.
Gracie (a cockatiel) lives in North Carolina with Susan, budgies Ellie, Tucker and Oscar and newly rescued cockatiel, Jojo. Gracie’s favorite person is Susan’s husband. If she hears his voice on the cell phone speaker she goes crazy. Gracie’s favorite toy is anything she can shred. 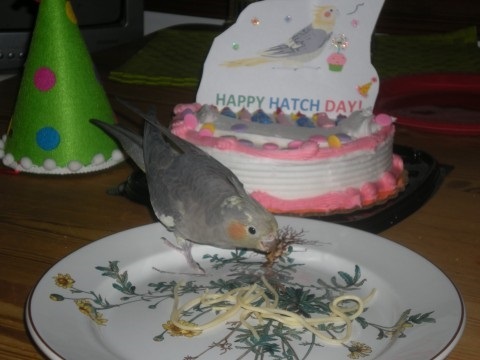 And her favorite treat is PASTA! 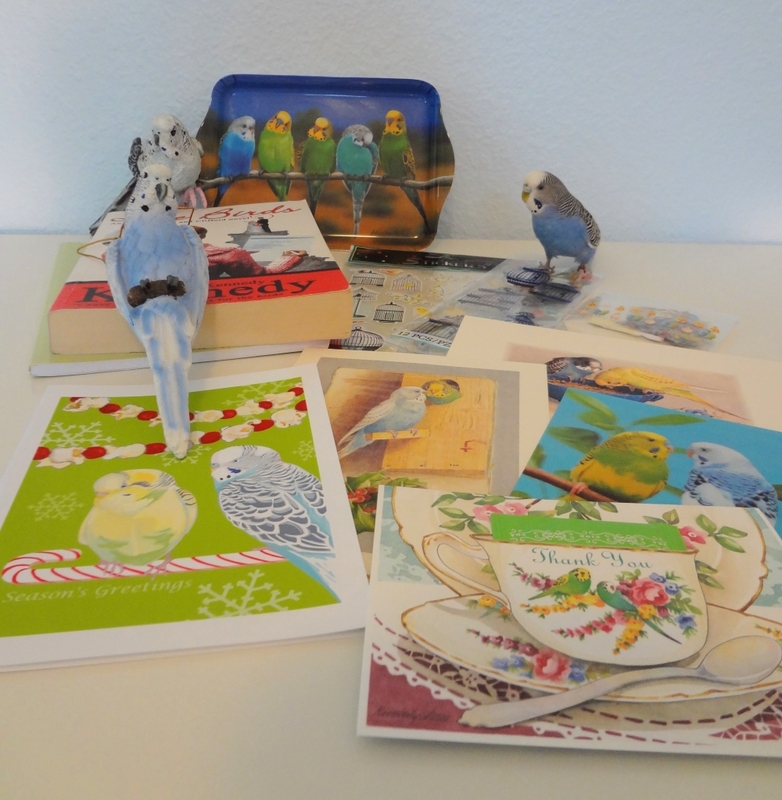 Posted on March 4, 2013 by Michelle M.
A box from Susan filled with budgie goodness: Budgie cards, budgie figurines, books, a cute little budgie tray and a bunch of budgie stickers! How lucky am I? Thank you Susan! 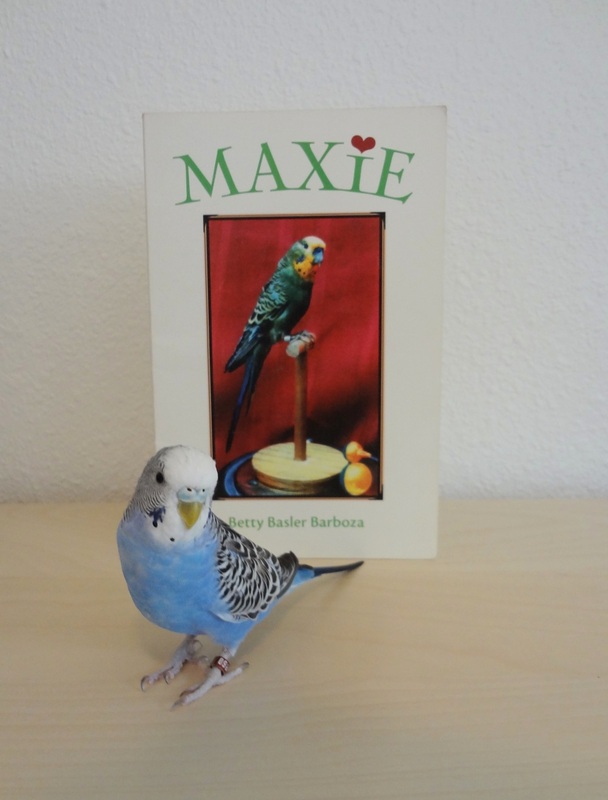 Posted on September 9, 2012 by Michelle M.
This short, but sweet little book (recommended by Susan) is about a budgie named Maxie and his life with the Basler family. 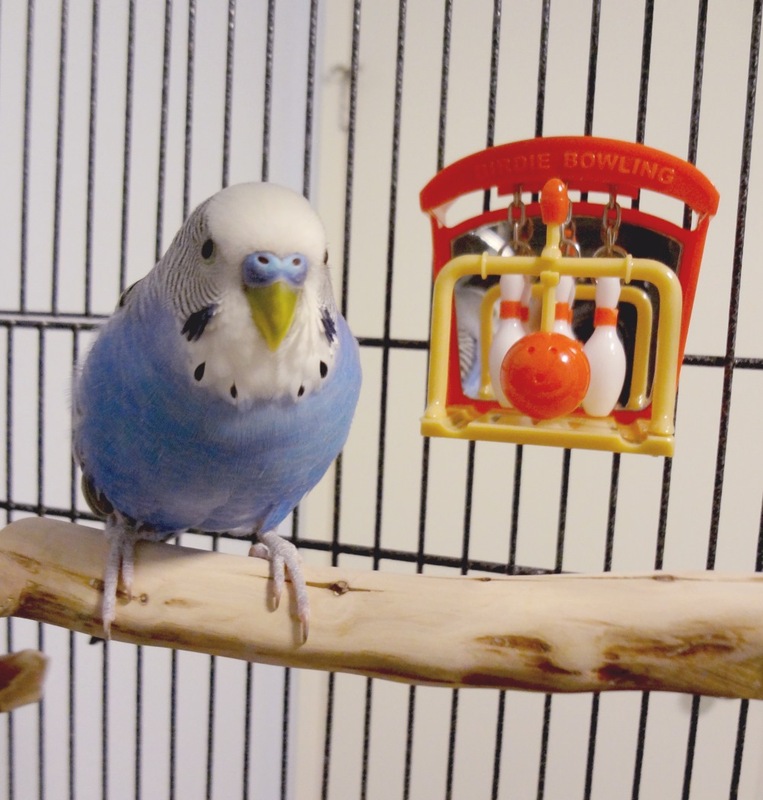 Maxie was a charming and talkative little fellow, who had a series of amusing adventures. Cooper’s favorite parts of the book where when Maxie saved baby Brad’s life (from poisoning!) and when Maxie dropped his toys to the floor (a game Cooper likes to play). The family loved Maxie so much they had him stuffed after he died (that’s stuffed Maxie on the cover – yikes).